Caroline Laguerre-Brown, the vice provost for diversity, equity and community engagement, said the survey is a critical tool for examining on-campus sexual assault using data. The campus climate survey on unwanted sexual behavior is currently accessible to all students in an effort to identify the full scope of sexual misconduct on campus. Student leaders and officials said they worked more closely this year to craft and promote the survey, which was released April 1, adding definitions for terms related to sexual assault and touting the survey as an opportunity for students to speak out about their experiences on campus. Amid a federal Title IX investigation, officials and students involved in the effort said the changes will help the Title IX office better assess its practices and resources. The survey will remain open to all students until the end of the month and include questions about sexual harassment, sexual assault and domestic violence. Previous surveys were only sent to a sample of the student body, student leaders said. Title IX Coordinator Rory Muhammad said this year was the first time since he arrived at GW in 2014 that there was a coordinated and sustained effort to partner with student leaders to develop the survey. “I think that’s been a great improvement for us because it gives us a different lens, more on the ground, people who we’re actually targeting the survey for who live it on a day-to-day basis, talk to their peers, etc., to give us feedback to improve the instrument,” Muhammad said. The University announced that the Title IX office would undergo a review by an external law firm last summer. GW fell under federal Title IX investigation for its handling of a sexual violence and harassment complaint last August. The investigation is still ongoing. Muhammad said students came together last summer through the Committee on Sexual Assault Prevention and Response, a group of faculty and student leaders formed in 2014, to present ideas – like opening the survey to all students and including language clarifiers – to the Title IX office on how to improve the survey. Caroline Laguerre-Brown, the vice provost for diversity, equity and community engagement, said the survey is a critical tool for examining on-campus sexual assault using data. She said student feedback at the end of the survey could shape how future reviews are conducted. In the past, Laguerre-Brown said the climate survey has prompted changes to policies and practices. She said officials added magnets describing sexual violence resources to all residence hall rooms last year after many students in a previous survey reported that they didn’t know how to report an incident. 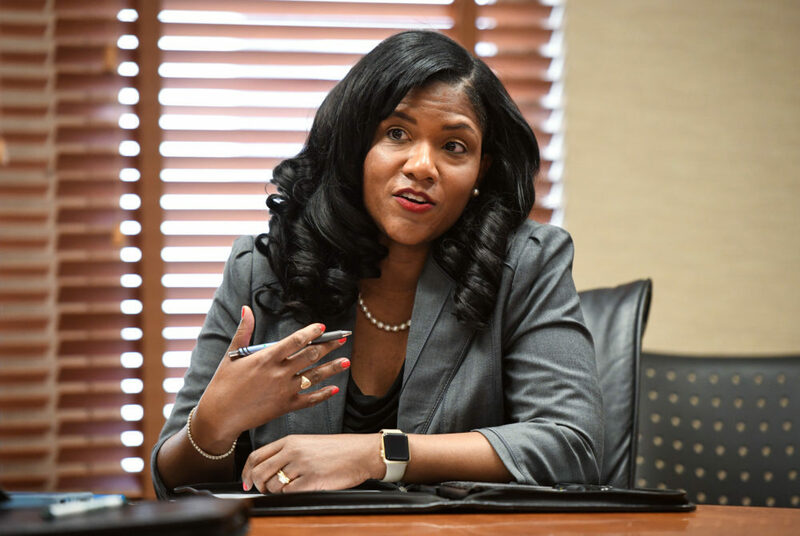 “We wanted to try to saturate areas that maybe we hadn’t reached before with information about the office and trying to make the information accessible, easy to read and easy for folks to get the information that they need to be able to connect to us,” she said. Kalpana Vissa, the co-president of Students Against Sexual Assault, said previous surveys were not large enough to capture a broad view of the issues with sexual assault on campus because they were only sent to a sample of the student body. She said this year’s survey includes definitions for terms that might not be common knowledge or might be misunderstood, like “flashing” or “consent.” The survey now also includes information about who to talk to if you’ve been affected by sexual violence and how to report an incident, she added. Vissa said response numbers for the survey have historically been low, with about 700 students responding out of 2,000 to 3,000 students who received an invitation – a participation rate below many peer schools. Officials first distributed the survey in 2014 to gauge the University’s response to sexual harassment, stalking and dating violence. About 713 graduates and undergraduates responded to the survey and nearly 25 percent of undergraduates said they experienced sexual harassment, sexual violence, domestic violence or stalking while at GW. The last survey in 2016 drew 715 student responses, but just 13 percent of students said they had experienced some kind of unwanted sexual behavior. After the 2016 survey, officials said they would conduct the survey less frequently. Peak Sen Chua, the president of the Student Association, said it was important to take a fresh look at the survey because this year’s graduating class is the last group of students that weren’t required to go through in-person sexual assault training, a measure implemented at Colonial Inauguration in 2015. “If we were able to compare the data that we receive this year with the data that we receive in subsequent years we’ll be able to look at how our efforts to prevent sexual assault and sexual violence on campus have worked,” he said. Sydney Nelson, the SA’s executive vice president, said the SA approached SASA last year to begin work on the survey and partnered with different student organizations, like the Panhellenic Association, on the effort. She said the project “fit nicely” into the University’s overall evaluation of its Title IX policies and procedures. Nelson said the student effort was in part motivated by the outrage last spring after a then-senior and sexual assault survivor accused the University of mishandling her sexual violence case and allowing her assailant to continue working a campus job. “I think this campus climate survey in partnership with SASA serves as a really great opportunity to kind of reflect the focus of the student body on this topic in a tangible way, and something that hadn’t been really touched before by students,” she said.